Claudio holds a degree in History, now studying for a Master in Modern and Contemporary History, in Lisbon, Portugal. Claudio has always been passionate for the radio, and by politics, trying to help the community. 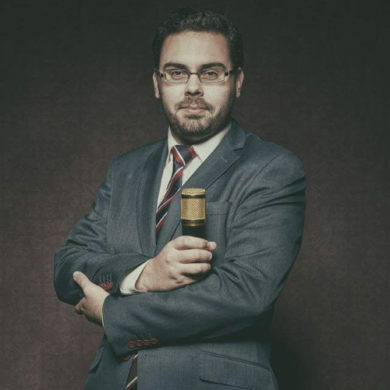 He has developed student projects, like a Society of Competitive Debates in the University of Lisbon and enjoys…organizing conferences and events. Two years ago, he organized a conference about the 30 years of Portugal in the European Union. Today the world is very strange and unpredictable. The traditional medias controlled by higher interests made space for a new force: podcasts. Podcasts are different, because it is more personal, a bigger interaction. The hosts let you give your opinions, so the control is not by a business man – but by a student, a teacher, a worker, who can seek information. I chose to talk about politics, with teachers, with members of the Portuguese Government, with Deputies of the Nation. With that I want to bring those who have power near to the voters, because I think that the distance between is huge. My podcast can provide a voice.